As a local business, Bay Optical cares about our neighbors. We will provide you with unsurpassed eye care, and are dedicated to affordability as well as quality. Bay Optical has been serving Warren, Washington and Saratoga Counties since 1968. Bay Optical Vision Services can offer you the best quality eye care available. From the eye health evaluations by our Board Certified Doctors, to the care given to fitting contacts or glasses by our professional staff, we guarantee you will have a great experience. 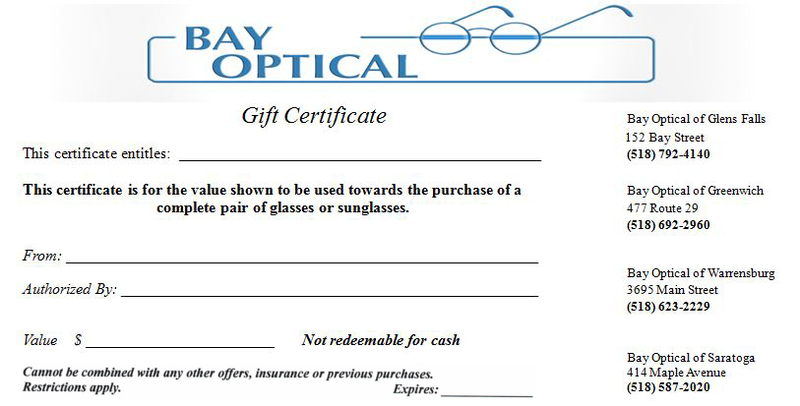 Stop by or call any Bay Optical to purchase your Gift Certificate today. "Dr. Dobie is the best optometrist I have ever been to. She's patient, kind, knowledgeable and thorough. As long as I can help it, she'll be my eye doctor forever. Thank you! P.S. the selection of frames was also wonderful and I now sport the prettiest glasses I have ever owned."